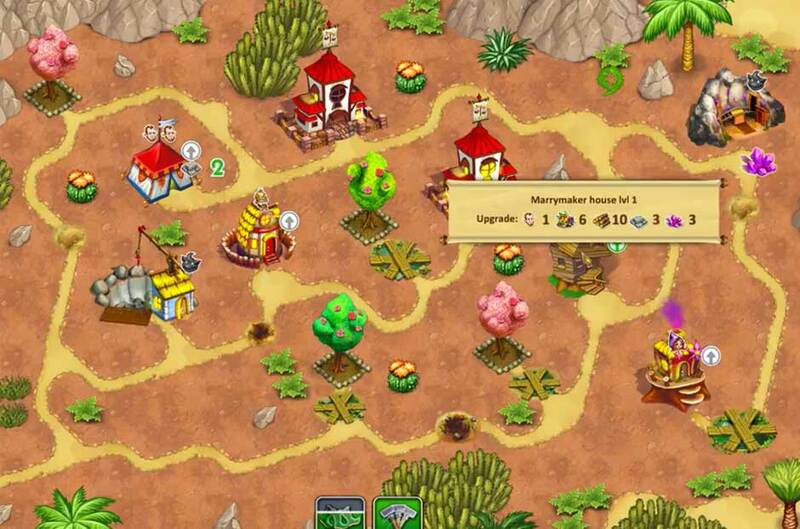 It’s all about strategy and time management in Gnomes Garden 3. The following section will walk you through some of the simpler tips and tricks you can employ in each level. 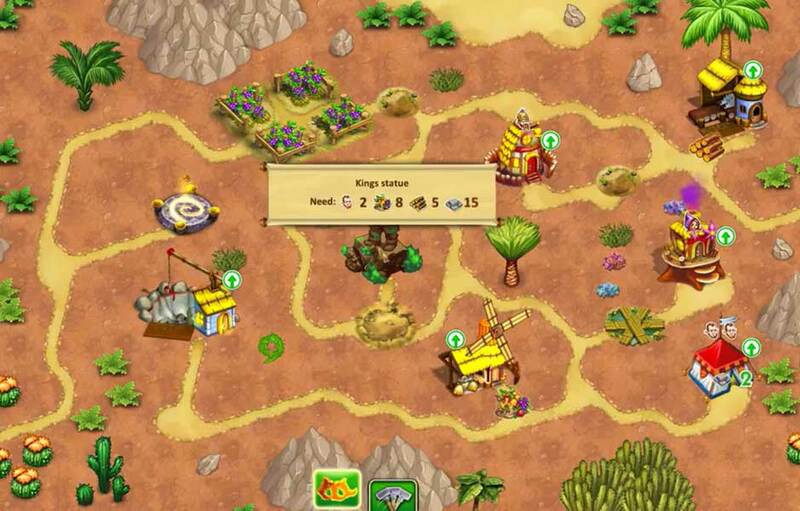 Four types of resources can be found in the game: Food, Wood, Stone, and Crystal. Use these resources to finish tasks displayed at the bottom of each level. 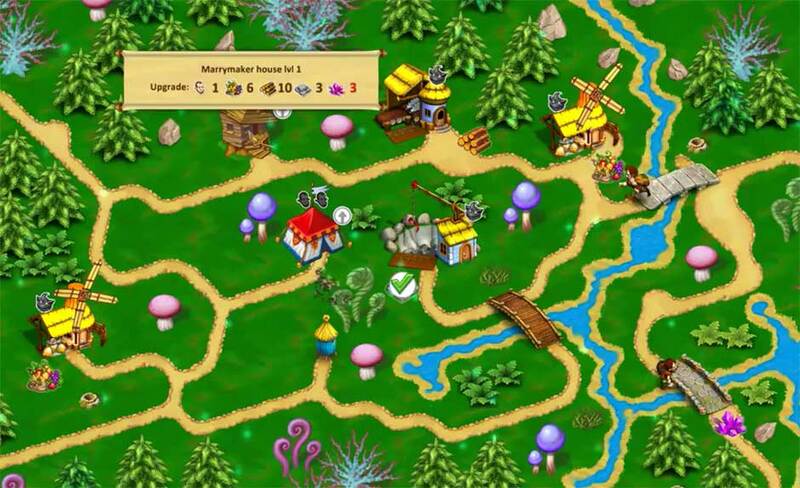 Buildings such as the Sawmill, Quarry, Mill, and Mine will provide you with a steady income of these resources. You can also swap or trade for resources at the Town Hall. A bar on the left with three stars indicates how long you have to complete a level. Finish all objectives before the bar drops belong the first star to obtain the highest score. Allies you will encounter on your adventure that inhabit buildings include the Workers, which complete basic labor tasks, the Sorceresses, your go-to for all things green and alive (plant and goblin alike!) and Firemen, who are capable of watering trees and chasing off troublemakers. Boosts will appear at the bottom of the screen during most levels. These boosts include Speed Boosts, which will allow your workers to move faster, Working Boosts to increase their speed in completing tasks, and Time Freeze Boosts to temporarily halt the flow of time. You can complete each level’s goals in any order. You can give multiple tasks to workers at a time. A white checkmark background indicates this is a current task and your workers will complete this first. Click on a checkmark again to deselect it or remove it from the roster. Click on any object to see whether or not you can currently reach it. If not, the path will highlight and reveal what’s blocking the way. At the start of a level, take a moment during the “Click to Start” period to think over your strategy before starting. If a building has put out a resource and it’s still sitting outside, it will not produce more until you gather that resource. Boosts charge separate from each other and can be used individually or together. Random resources are produced by altars. If you’re missing a resource that can’t be produced by a building on the map, look to an altar for help! 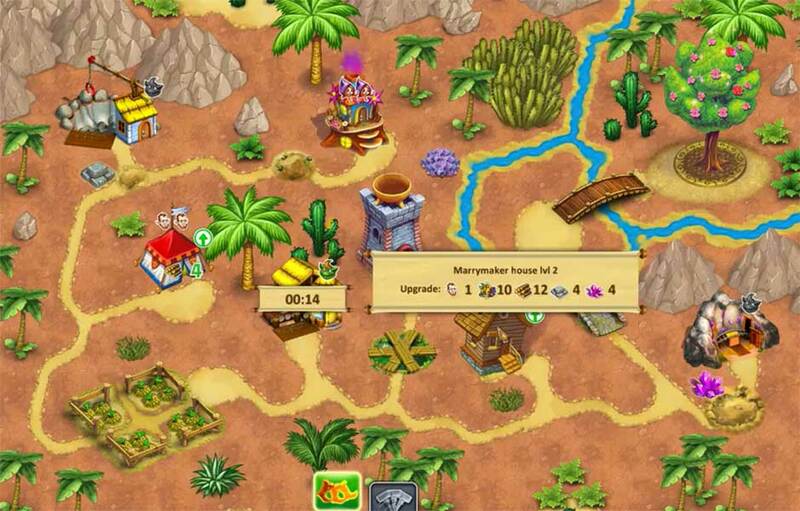 Marrymaker trolls may appear during the game and will hamper your workers if they cross paths. You can upgrade a building when the arrow over it turns green. A grey arrow indicates it can be upgraded, but you do not currently have enough resources. The Thief of Castles has struck! It’s up to you to track him down and save both the kingdom and your family. The adventure is beginning! But you need to stock up on supplies before the big adventure! Collect the two food resources to the right of the tent. Click on the log down the path on the right to clear it, gaining additional wood resources. 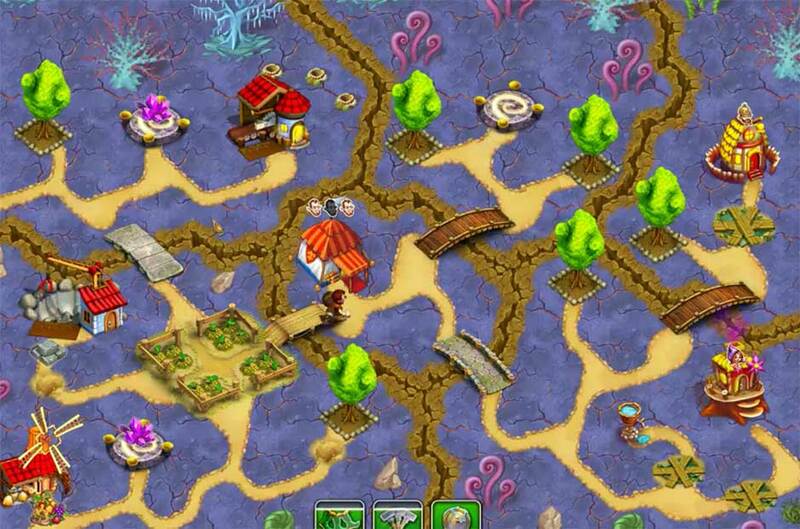 Clear the wood blocking the road on the lower right and collect the two food resources there. Click on the farm on the right to restore it, completing your first objective. 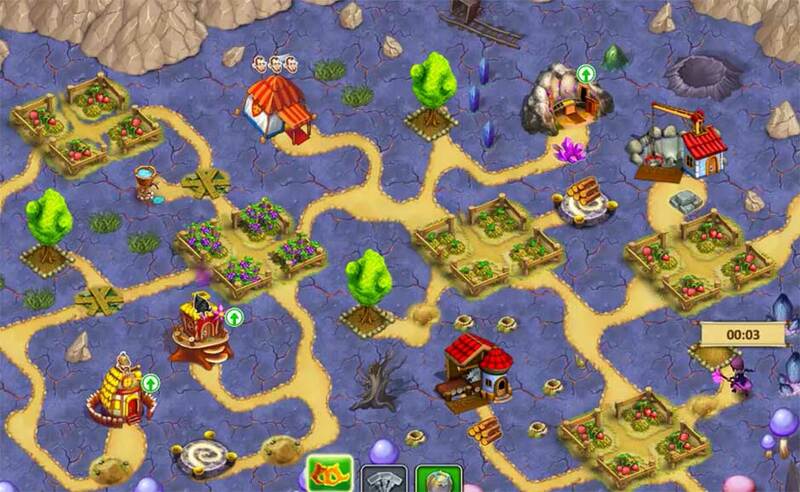 Clear all remaining obstructions and collect food from the two farms until the level is complete. A recent hurricane destroyed the farm, the sawmill, and the bridge. You decide to help the local residents deal with the aftereffects of this natural disaster. Collect the wood and food resources on the path next to the tent, then collect the wood resources down the road on the lower left. Build a level 2 worker’s tent right away to help with tasks. Collect food from the first farm and clear the path to the second, starting to collect food there as well. Continue collecting wood until you have enough to build the sawmill. Clear the large obstruction leading to the upper portion of the map. Here, make your way to the second sawmill sight and rebuild it. Repair the bridge leading to the right to access the last farm and restore it. Don’t forget to keep gathering wood throughout this process! Hm, I wonder if fish in the magic forest are edible? Let’s find out! Collect the food resources along the road. Clear the wood obstruction beneath the tent so that you can access the farm. Upgrade the worker’s tent right away to accomplish tasks faster. Gather all the wood resources around the farm, then clear the obstruction leading down to the quarry. Rebuild the quarry and clear the small stone roadblock on the right. Pick up the stone along the road and fill in the pothole to reach and the fishing nets. Now start clearing the way to the sawmill and second farm. Have one worker continue to collect resources from the farm and quarry. Rebuild the sawmill first, then the farm and the mill. 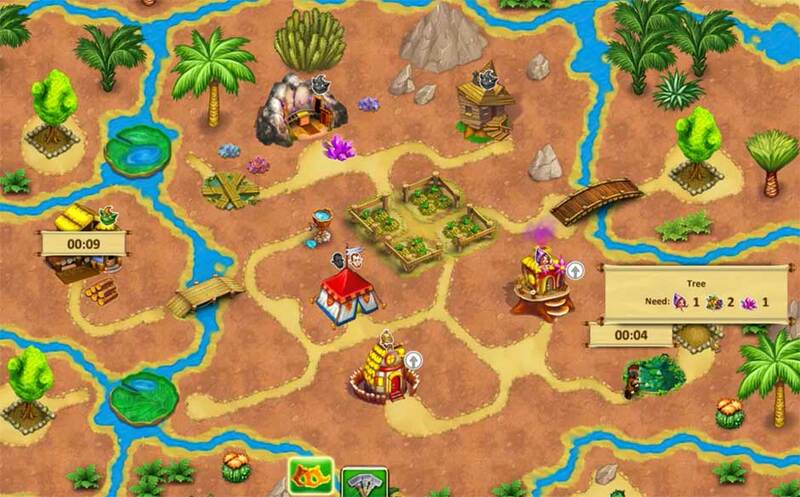 Gather resources until you have enough to return to the fishing nets, repairing them and completing your objective. Looks like the local residents are starting to warm up to the gnomes. If only it could go both ways. Gather the food resources and wood resources along the road. Clear the wood and stone obstructions to gain access to additional resources. As soon as you have enough, pave over the bog in the upper portion of the map. Pick up the resources lying along the path. Clear the wood obstruction on the top path to gain additional wood resources, then rebuild the mill. Upgrade your worker’s tent. Continue clearing obstructions in order to reach the sawmill and the quarry. Rebuild the sawmill with one worker as the other clears the path to the quarry. Rebuild the quarry. Clear the last obstruction on the lower path, ignoring the pothole on the right. Build the worker’s tent to complete your objective. Sometimes bridges are the only path, and other times they’re just the shortest of several paths. Gather the wood resources right outside the tent and repair the bridge on the right. Continue by clearing the large wood obstruction, and the small wood obstruction after that to reach the sawmill. Gather the food resources along the road, then clear the last wood obstruction on the lower path and rebuild the sawmill. Repair the bridge on the upper path above the tent. Continue to gather wood resources until you have enough to rebuild the mill. 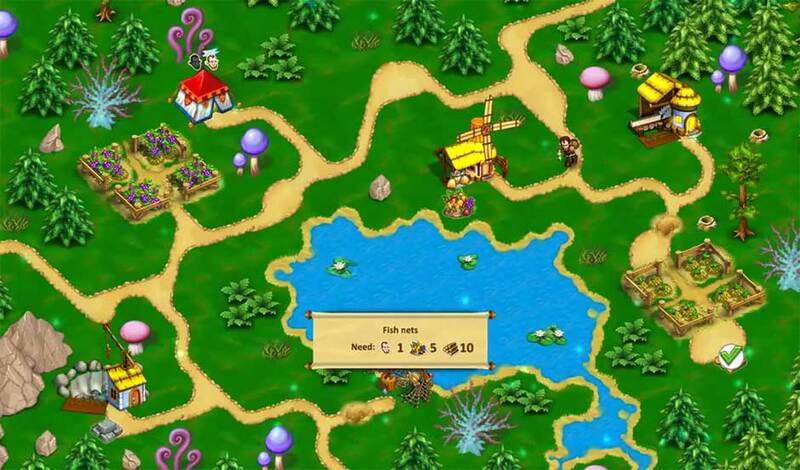 Gather resources from the mill and the sawmill until you have enough to pave over the bog to the right of the mill, giving you access to the farm and additional food resources. Continue to gather wood and food resources, clearing the remaining wood obstructions for additional resources. Upgrade the worker’s tent and have one worker continue to gather resources as the other repaves the bog on the lower right. Rebuild the sorceress’s house on the far right. 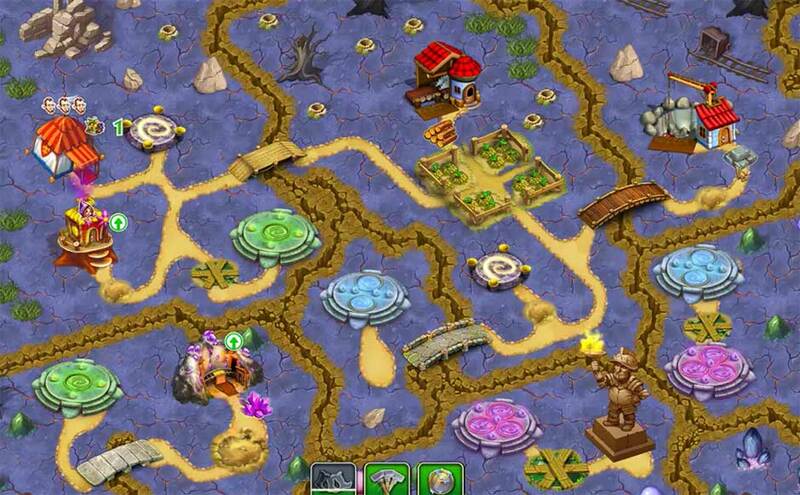 Pave over all remaining bogs and gather all remaining resources, including (and especially) the crystals. Select the withered trees to have the sorceress restore them, completing the level. Immediately upgrade the worker’s tent. With two workers at your disposal, start gathering all the resources lying along the path. Clear the wood obstructions on the path. Rebuild the mill and clear the stone obstruction on the lower right. Clear the wood obstruction on the bottom path as soon as you have enough resources. As soon as you have enough food and wood, restore the beehive to gain access to the upper path. 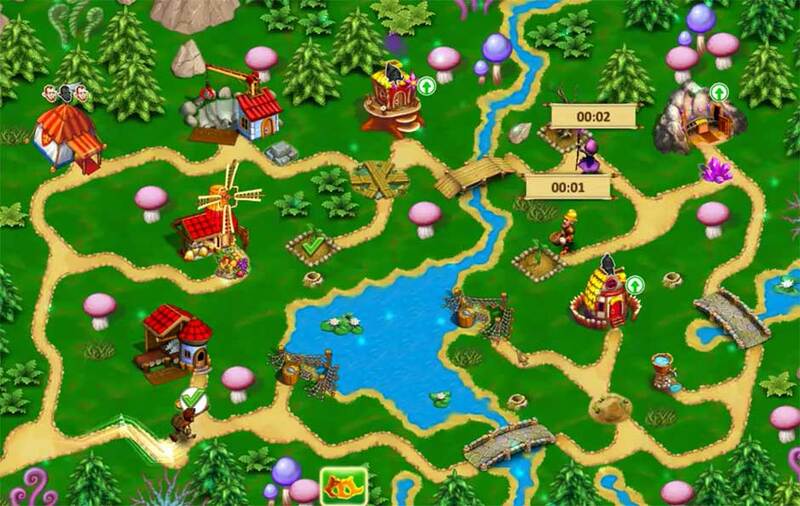 Gather all the free resources here and clear the wood obstruction leading to the second mill. 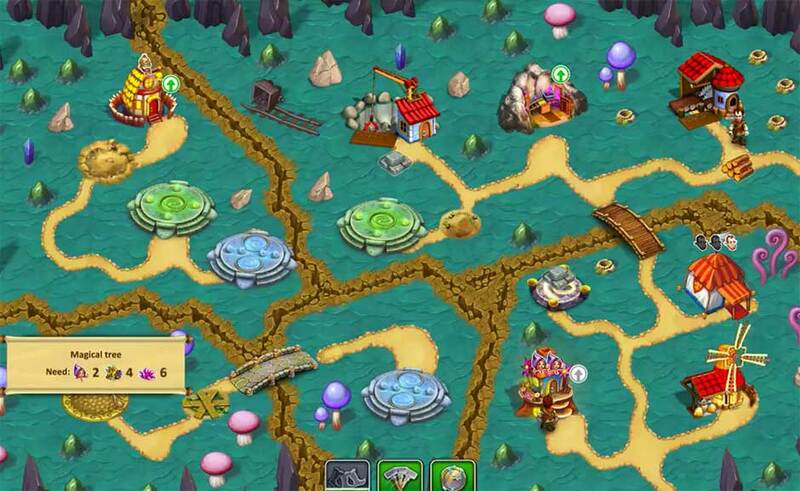 Continue clearing obstructions and gathering resources until you reach the quarry. Repair the wood bridge and rebuild the quarry. 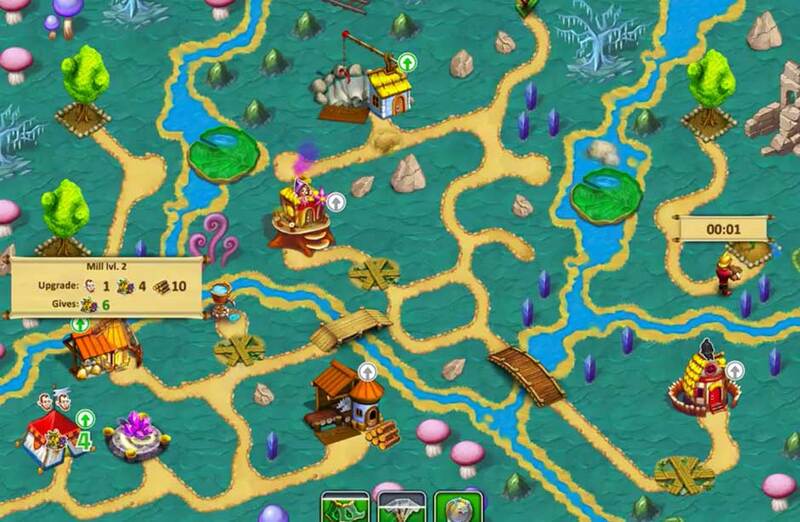 Rebuild the stone bridges as soon as you have enough resources and gather the crystal resources lying on the path. Use these crystals to upgrade the marrymaker’s house. Plants aren’t just sentient here, they also love to joke at the expense of hapless wanderers. Gather the wood resource right outside the tent. Head down the path and clear the wood obstruction. Upgrade the worker’s tent right away. Gather resources with one worker and clear the bottom and right path obstructions with the other. As soon as you have enough resources, fill in the pothole leading to the sawmill. Clear the stone obstruction on the bottom path and rebuild the sawmill. 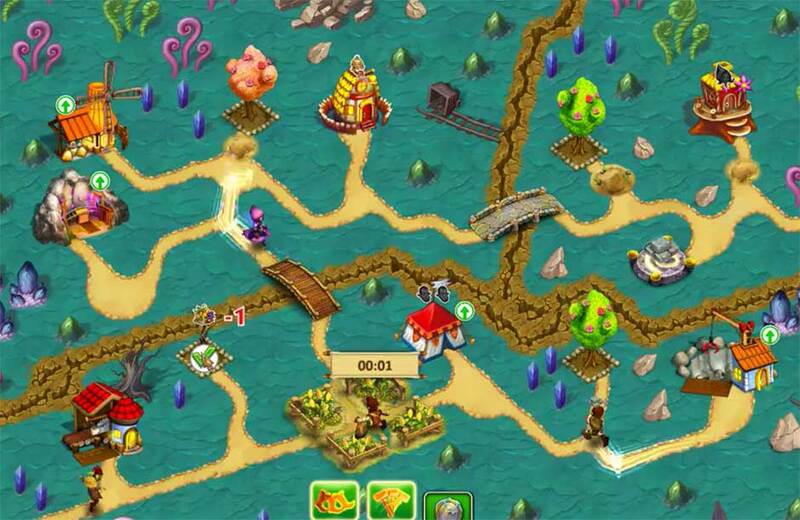 Continue to collect resources until you have enough to pave over the bog on the lower right. Once done, rebuild the fireman’s house. Use the fireman to remove the barrier on the left, next to the farm. Continue to gather resources with one worker while the other removes path obstructions on the left. Pave over the bog on the upper right and rebuild the sorceress’s house. 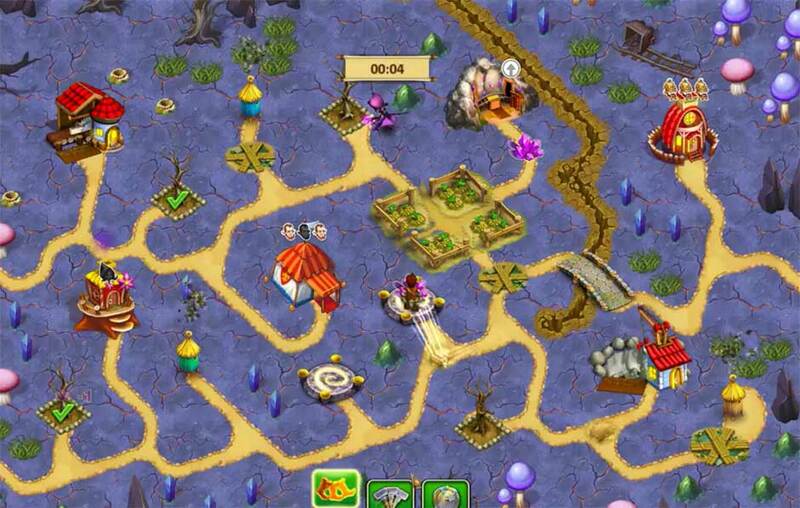 Plant a tree using the sorceress and banish the stone sleeper on the upper left, followed by the giant troll. Have the fireman water the tree as the sorceress plants the second. Water the last tree to complete your objective. About time to barter with these sentient mushrooms. When will a chance like this roll around again? Gather the food resource on the far right and clear the wood obstruction on the left. Exchange food for wood at the town hall. Rebuild the mill on the far right and gather food from the farm. Exchange food for wood at the town hall again and continue to do this until you have enough to pave over the bog on the left. Upgrade the tent during this time to make your gathering task faster. Clear the path leading down on the left once the bog has been paved. Remove the obstructions and pave over the large bog blocking the way to the sorceress’s house. Pave over the bog on the bottom path leading to the right. Clear the final wood obstruction on the lower path. Pave the last bog on the bottom path and remove the obstructions leading to the second town hall. Exchange resources at the second town hall and continue to gather until you have enough to fill in the pothole leading to the sorceress’s house. Rebuild the sorceress’s house. Use the sorceress to remove the giant trolls, starting with the one closest to the tent. Rebuild the farm, gather, and exchange resources until you have enough to banish the last two trolls and pave over the last bog. You can leave the final two potholes alone and still complete your objectives. That mushroom family warned you about the gremlins they spotted not far off. Wonder what they need? Collect the wood outside the tent and clear the wood obstructions on the path. Upgrade your tent to acquire an additional worker. Pave over the bog leading to the beehive and repair it. Clear the stone obstruction from the path and rebuild the sawmill. Clear the stone obstruction on the far left path and gather the wood resources leading up to the bog on the upper left. As soon as you have enough resources, pave over this bog and repair the farm. Continue to clear the upper path, repairing the bridge leading across the water and make your way to the quarry, rebuilding it. Repair the path in front of the beehive on the upper right and then restore the beehive. Clear the path leading to the fireman’s house, paving over the bog to reach it. Gather all remaining resources, repairing the stone bridge at the bottom of the map and paving the remaining bog on the left side of the map. Late at night someone snuck into the settlement and broke the zipline. The guard couldn’t do a thing – they knocked him out. Gather the resources around the tent and clear the obstruction leading toward the mill. Continue to gather resources along the path and clear obstructions on your way to the quarry. Upgrade the worker’s tent. Pave over the bog just past the quarry and rebuild the sawmill. Clear the last obstruction blocking the quarry and rebuild it. Next, restore the stone bridge at the top of the map. 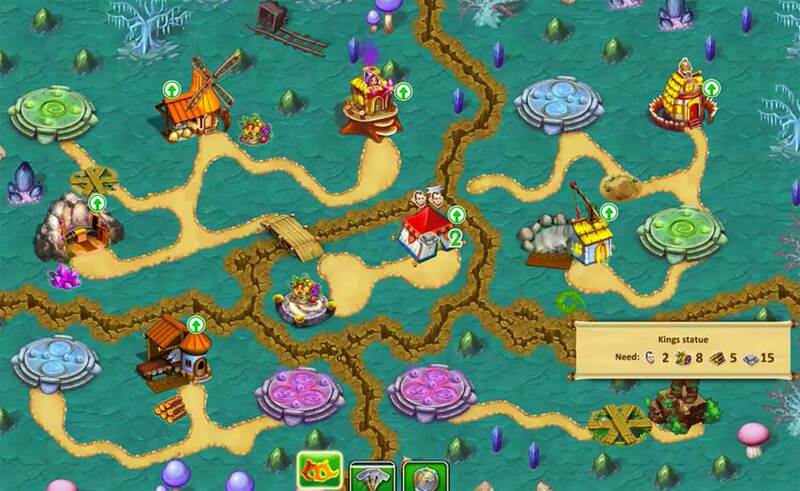 Gather enough resources to rebuild the sorceress’s house. Fill in the small pit at the bottom of the map and restore the cableway. You can now access the right side of the map. Gather the resources along the path here and clear all path obstructions. 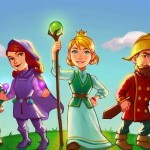 Plant the trees using the sorceress and rebuild the fireman’s house. Use the fireman to water the trees after the well is repaired. In the years of her travels, the princess has learned a lot. Now she’s privy to how giant magic trees are created. Gather the resources along the path outside the tent. Clear the large stone obstruction on the upper path and fill in the small put on the lower. Harvest food from the farm and clear the obstruction blocking the way to the sawmill and rebuild it. Upgrade the tent and gather the resources on the upper path and rebuild the mill. Continue to gather resources and clear the wood obstruction below the tent. Rebuild the quarry and clear the stone obstruction on the upper path. Continue to clear obstructions all along the upper path and gather the resources as well. Fill in the holes in the road toward the right and pave over the right bog leading toward the sorceress’s house. Clear the final obstruction and rebuild the sorceress’s house. Once you have enough resources, use the sorceresses to banish the giant troll. Clear the stone obstruction blocking the way to the crystal mine and rebuild it. Now clear the obstructions blocking the way to the large tree planter in the center of the map. As soon as you have enough resources, upgrade the sorceress’s house. Click on the large planter to have the sorceresses plant the large tree. Look at all these dried-up magic trees! A real princess simply wouldn’t be able to cross! Repair the bridge on the right. 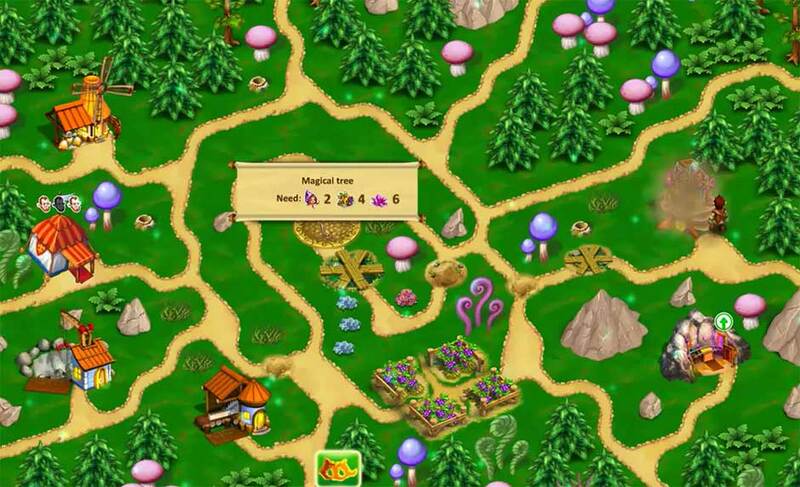 Gather the food resource and remove the wood obstructions on the lower and right paths. Harvest food resources from the farm and rebuild the sawmill on the right. Now repair the bridge below the tent. Clear the obstructions on the lower path and gather the resources here. Once you have enough resources, repair the bridge on the left. Clear the wood obstruction and gather all resources on the left leading to the bog. Pave over both bogs and remove the last obstructions here. Rebuild the quarry. Now you can focus on the lower right path. Fill in the pothole and clear all obstructions leading to the mine and the sorceress’s house. Rebuild the sorceress’s house, the mine, and the marrymaker’s house. Click on each of the trees to have the sorceress restore them as soon as you have enough crystal resources. Gnomes don’t like to run fast, but sometimes they make an exception to this rule. Gather the resources around the tent and clear the wood obstructions on the lower path. Make your way to the sawmill and start gathering resources here, too. Upgrade the worker’s tent. Clear the path leading to the quarry and rebuild it. Pave over the bog on the top path and rebuild the sorceress’s house. Repair the wooded bridge right next to it to access the second half of the map. 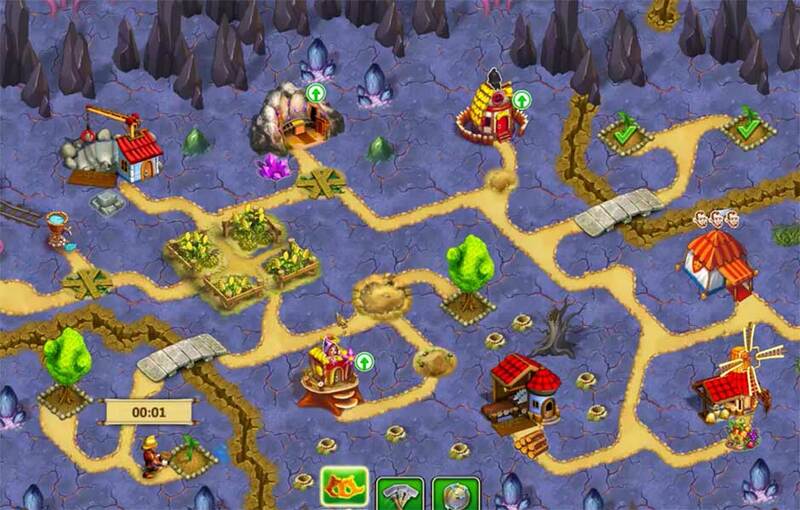 Continue to clear the obstructions on the right side of the map and rebuild the crystal mine. Restore the stone bridge at the bottom of the map and fill in the pit leading to the fireman’s house. Rebuild the fireman’s house and repair the fishing nets. Have the sorceresses plant trees in all the empty planters and have the fireman water them. Restore the final tree with the sorceress to complete your objective. A statue of the ancient king of the gnomes: How old is it, and who does it belong to? 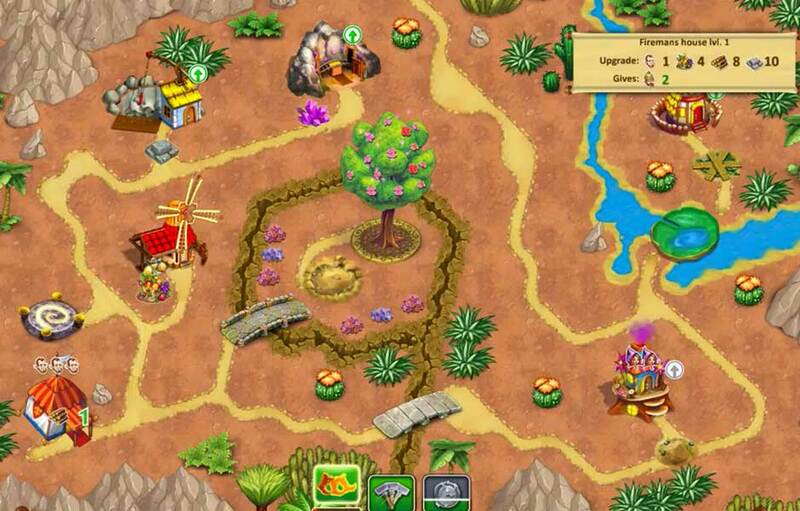 Gather the resources along the path and clear the obstructions leading to the thornbush. Clear the obstructions leading into the upper path and upgrade the worker’s tent. Fill in the pit blocking the way to the farm and gather food resources. Rebuild the sawmill in the upper right corner and continue clearing the upper paths. When you have enough resources, fill in the put leading to the fireman’s house and rebuild it. Pave over the bog near the tent and rebuilds the sorceress’s house. Once rebuilt, use the sorceress to banish the giant troll and the stone sleeper. Rebuild the quarry and the portal once the troll has been banished. Fill in the large pit leading to the king’s statue and repair it to complete the level. There are legends about the workmanship of gnomes, and their ruler is inspiring them to new heights, sometimes with the help of magic. Clear the obstructions around the tent and gather the resources, too. Upgrade the worker’s tent after collecting from the farm. Repair the bridge on the left and rebuild the sawmill. Next, rebuild the sorceress’s house and the fireman’s house. Clear the obstructions on the upper path and rebuild the mine, followed by the marrymaker’s house. Rebuild the wood bridge on the right and repair the well near the farm. Click on the kraken’s tentacle on the lower left to have the fireman remove them. Use the sorceress to grow the lily pad and reach the planter. 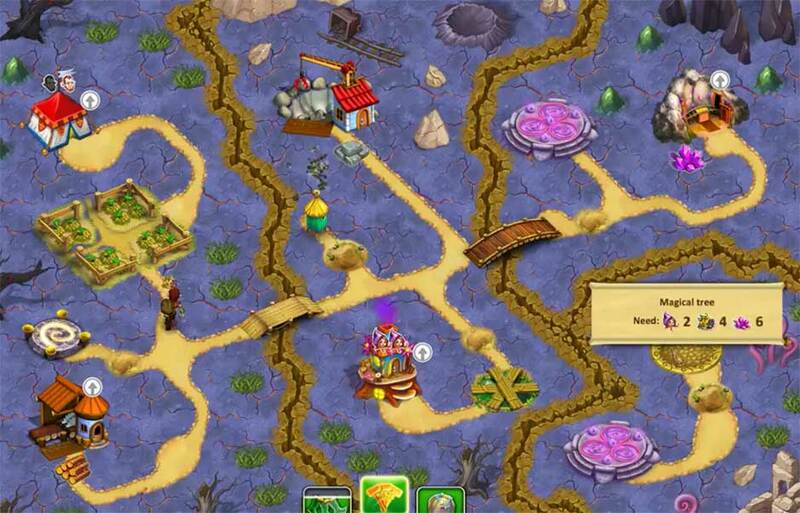 Have the sorceress plant trees and the fireman water them, paving over the bogs as soon as resources allow and repeating the process to complete the level. Don’t forget to grow the lily on the upper left to access the final planter! A holy circle in the dead center of the desert – it’s destroyed, but still holds its power. 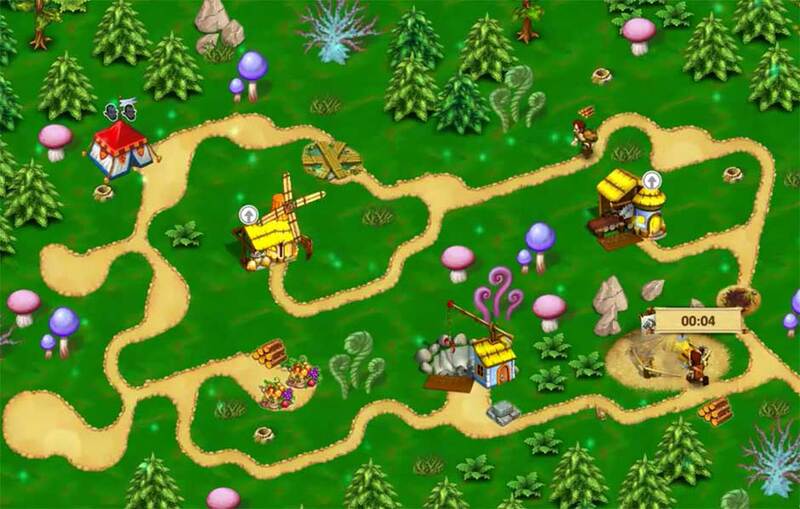 Gather the resources around the tent and clear the wood obstruction leading to the farm. Upgrade the tent and clear the obstructions leading south of the farm while your other worker gathers resources. Make your way to the sawmill and rebuild it. Make your way to the quarry and rebuild it. Gather all the resources along the road and take the lower path to the stone bridge and rebuild it. Clear obstructions and rebuild the mill and the fireman’s house. Pave over the bog on the lower path and fill in the large pit on the upper path. Restore each of stonehenge’s columns to complete the level. Each gnome has his own story about what he’s seen in a portal. Gather the food resources around the tent and clear the wood obstruction. Continue to gather resources and start clearing the path leading upward. Upgrade the tent for a second worker. Have one harvest from the farm and clear the wood obstructions on the road leading to the sawmill and rebuild it. Clear the path leading to the wood bridge and restore it. Pave over the bog on the left to access the portal. 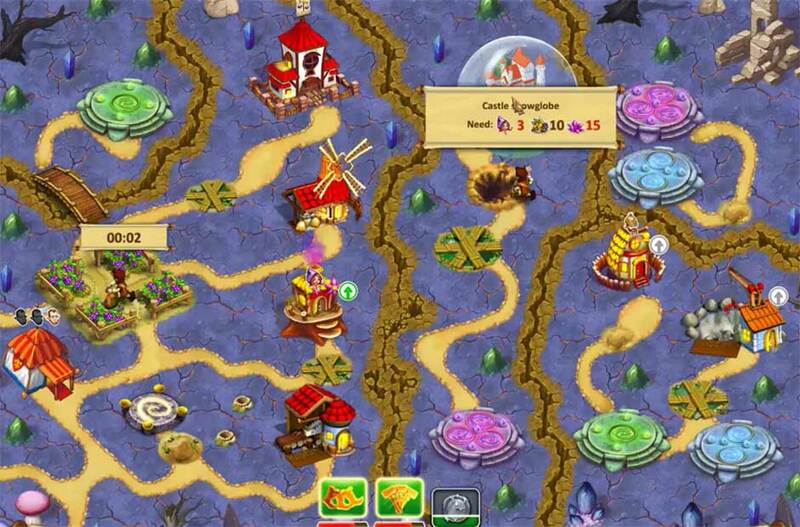 Clear the obstructions leading to the crystal mine and sorceress’s house and rebuild them both. Use the sorceress to activate the portal once you have enough resources. 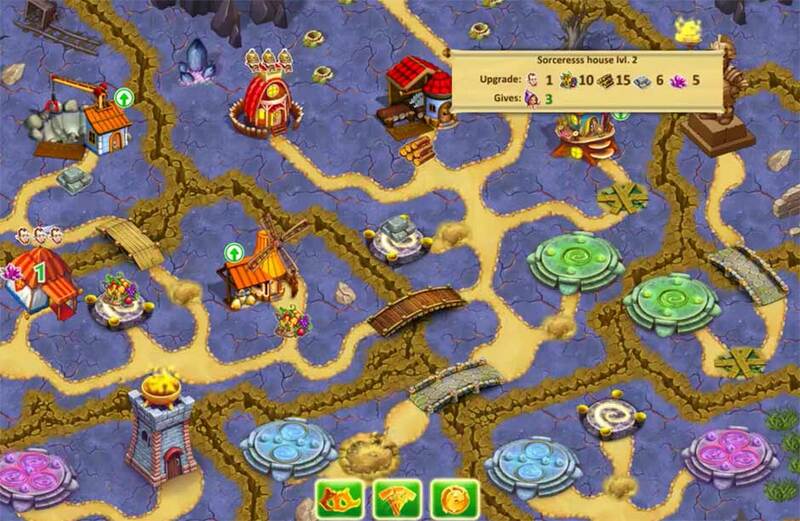 Once you’ve reached the lower right corner of the map, continue to clear it and rebuild the quarry once you reach it. Next, make your way to and repair the first altar. Continue to clear the path, banishing the troll with the sorceress, and rebuild the final altar to complete the level. In the land of cat-people, crystals are the currency. You should stock up. Gather the resources around the tent and upgrade it right away. Clear the obstructions on the path leading down and to the left. Rebuild the mill and the quarry. Continue to clear the path on the way to the fireman’s house and rebuild it. Continue to clear the lower path and rebuild the sawmill. Make your way to the marrymaker’s house and rebuild it. Stop any goblins that show up on the lower path by clicking on them when they appear. Remove the thornbush on the upper path and fill in the pit on the way to the well. Restore the well and fill in the pit to the left, rebuilding the crystal mine. 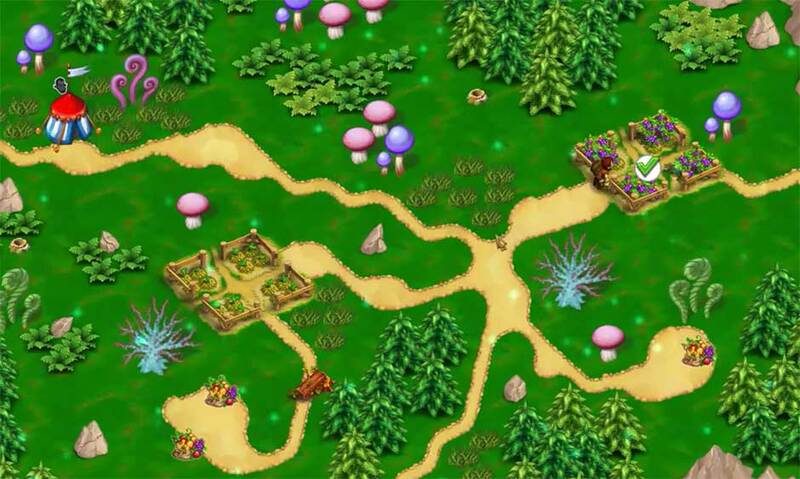 Continue to clear and restore the path on the way to the sorceress’s house and rebuild it. Restore the stone bridges at the bottom of the map. Plant the trees with the sorceress and water them with the fireman to complete the level once you’ve stocked up on enough crystals. The branches on some trees have dried out while other trees have withered completely. Gather the food and clear the stone obstruction to the right and for the upper path. Continue down the path in the upper left corner, gathering resources and clearing obstructions until you reach the quarry. Upgrade the tent and use the town hall to exchange resources. Continue clearing the paths on the bottom and to the right of the town hall, gathering additional roadside resources along the way. Make your way to the marrymaker house and rebuild the fireman’s house via the road on the right. Remove the thornbush with the fireman and rebuild the crystal mine. Continue down the far right path to the sorceress’s house and rebuild it. Once there, continue gathering and exchanging resources to pave over all the bogs. Restore the trees and upgrade the marrymaker house to complete the level. An earthquake split the plateau into two parts separated by a deep fissure. And you need to be on the other side! Gather the resources outside the tent and clear the obstruction leading to the mill. Rebuild the mill and continue clearing the paths. Make your way to the sawmill and clear the bog in front of it. Rebuild the sawmill and clear the lower path leading up to the quarry. Rebuild the quarry and continue clearing the path at the bottom of the map. Rebuild the stone bridge and restore the sorceress’s house. Use the sorceress to get rid of the giant trolls, starting with the top and bottommost pair. Make your way to the mill and the fireman’s house, rebuilding both. Banish the remaining trolls and repair the last bridge on the far right to complete the level. The warlock is all-powerful. To conquer him you need a lot of magic, which comes from big trees. Gather the food resource outside the tent and clear the obstructions leading down to the farm. Gather the food and upgrade the tent to gain an additional worker. Continue clearing obstructions on both the lower path and path leading up on the left. Rebuild the sawmill and fill in the pit in the upper left corner. Rebuild the quarry. Keep gathering resources and make your way toward the marrymaker’s house. Don’t rebuild it just yet – clear the large wood obstruction first. Fill in the pit in front of the sorceress’s house and rebuild it. Continue gathering resources and fill in the large pit in the lower right corner in front of the mine. Rebuild the mine. Pave over the bog on the way to the beacon. Keep one worker gathering resources while the other works on clearing the way to the planter in the upper left corner. Have the sorceress plant the large tree. 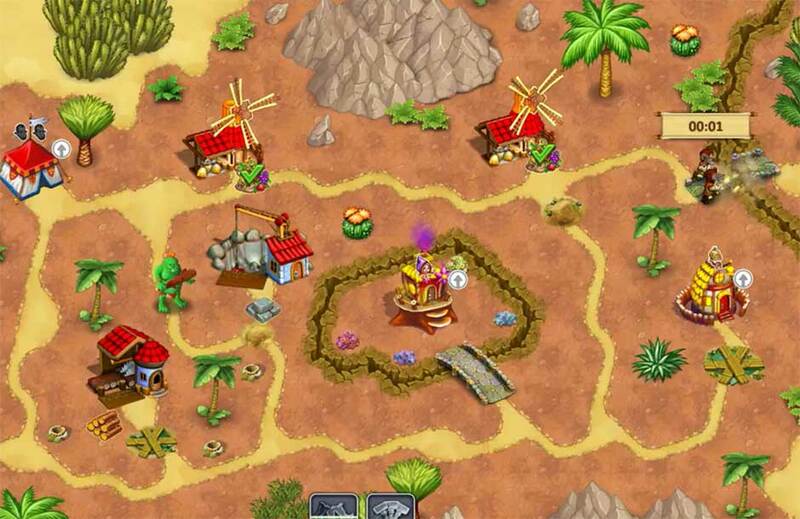 Next, continue gathering resources in order to build and upgrade the marrymaker’s house until it reaches level 3. Your scouts have found some old mechanisms of the ancient tribe of gnomes that once lived here. Now is just the time to restore the mechanisms – they might come in handy. Gather the food outside the tent and start clearing the wood obstructions from the path. Gather from the mill and use the resources to upgrade the tent. Have one worker gather resources while the other works on clearing the path to the sawmill. Rebuild the sawmill. Clear the obstruction blocking the path to the cableway. Clear the stone blocking the way to the quarry and rebuild it. Upgrade the mill and the sawmill. Upgrade them again as soon as you have enough resources, focusing on the sawmill first. Next, work on upgrading the quarry. Rebuild the cableway to access the second part of the map. 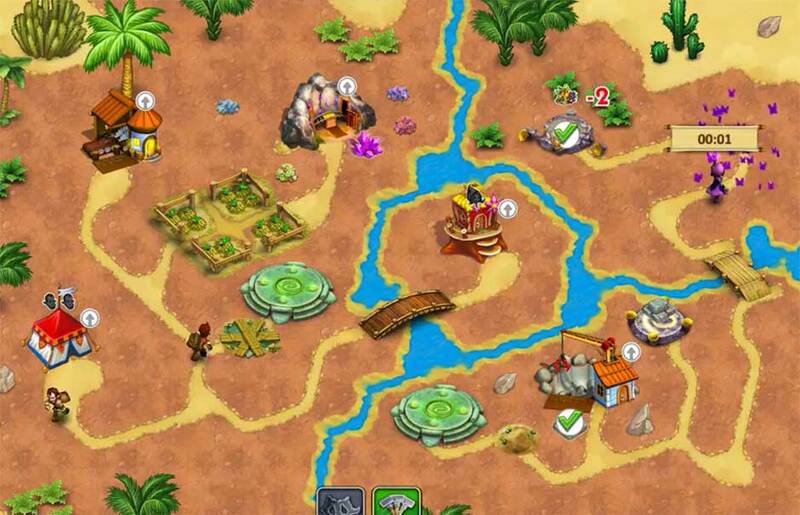 Once there, have one worker focus on gathering resources on the left side of the map while another clears the obstructions on the bottom right. Repair the fish net while you’re here. Make your way up to the stone bridge and repair it. When you reach the mine, rebuild it. 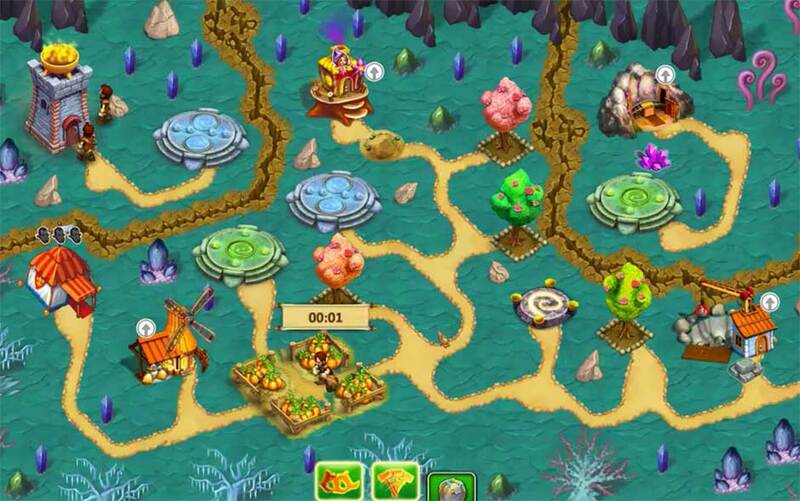 Continue to upgrade the mine until it reaches level 3 and stock up on food and crystals to complete the level. If you restore dried up trees and plant a new one, you can bring life back to the desert. Gather the wood outside and start clearing the path in the center leading up first. Make your way to the mill and rebuild it. Now head down the path, clearing the way to the sawmill. Rebuild the sawmill. Continue gathering resources and clear obstructions from the path on the lower right. Upgrade the worker’s tent at this point. Rebuild the mine and the sorceress’s house. Start clearing the left paths. Beware the goblins wandering around! 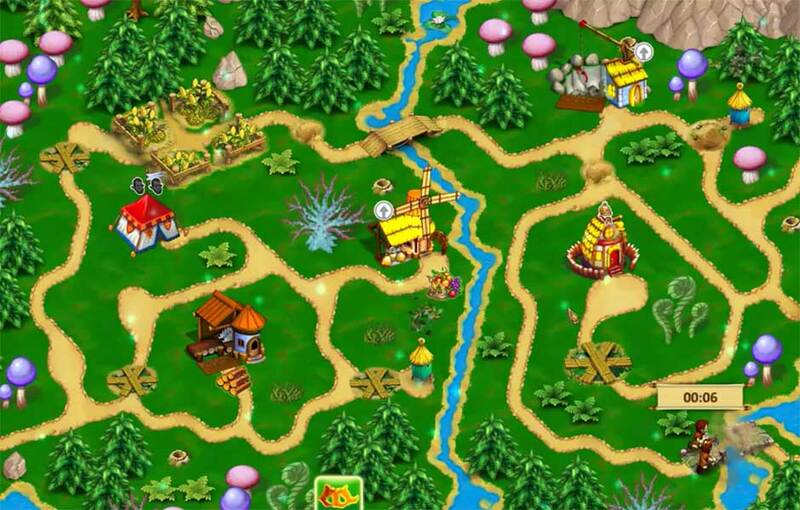 Keep gathering resources, clearing all paths before heading to the fireman’s house. Rebuild the fireman’s house. You will need to pave a bog first. Once build, upgrade the fireman’s house to level 2. 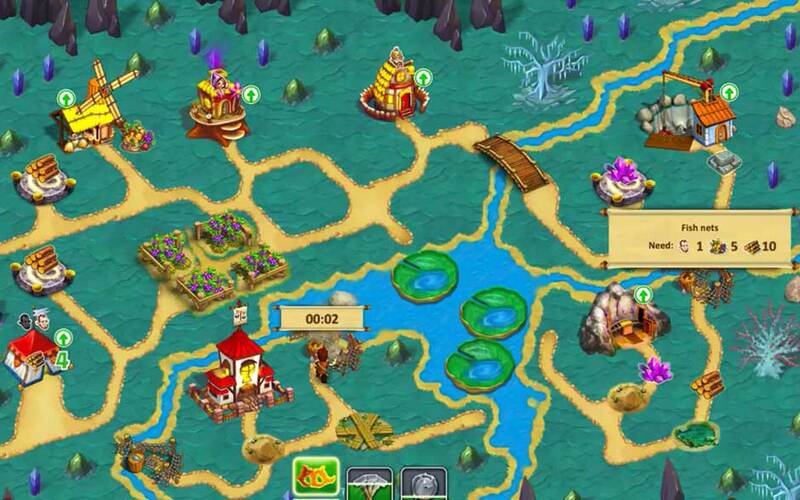 Gather all remaining resources on the map and use the sorceress to restore trees and plant new ones. Water the new trees with the fireman after repairing the well on the lower left. Gather the food resources outside the tent and clear the wood obstruction blocking the path leading up. Continue clearing the road, collecting from the altar and rebuilding the mill. Once rebuilt, upgrade the worker’s tent. Keep clearing obstructions leading up and toward the right. Make your way to the quarry and rebuild it. Once built, focus on clearing the bottom road. Repair the stone bridge and make your way to the sorceress’s house. Fill in the pit and rebuilt the sorceress’s house. When you have enough crystals as dropped by the altar, drive away the giant troll and rebuild the mine. 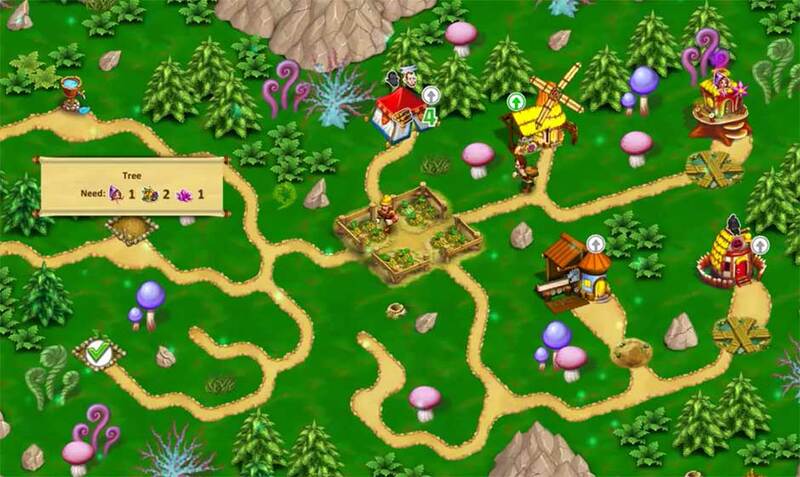 Continue gathering resources along the rightmost path and grow the lily leading to the fireman’s house. Upgrade the worker’s tent again and upgrade the fireman’s house. Restore the path leading to the planter in the center and use the sorceress to plant the large tree. This wharf is long abandoned, but a horrifying kraken still abides. If the princess wants to reach the crystal caves, she’ll have to deal with it. Clear the wood outside the tent and gather the food. Rebuild the mill and start clearing the stones on the left. Work your way up to the town hall where you can exchange resources. Continue working up this path until you real the sawmill and rebuild it. Keep gathering and exchanging until you can clear the obstruction on the path leading downward. Upgrade the worker’s tent at this point. Leave the pit for now and clear the upper path leading to the bridge. Restore the wooden bridge. Keep clearing the path on the way to the farm and gather resources here. Continue working your way around, clearing obstructions and filling in the pit so you can reach the sorceress’s house. Rebuild the sorceress’s house and fill in the large pit to gain access to the crystals. Fill in the pit in the lower left corner to reach the fireman’s house. Rebuild the fireman’s house. 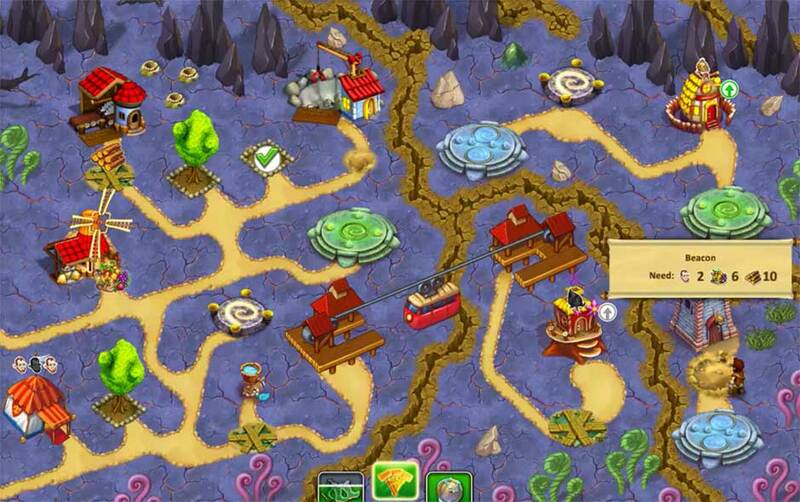 Clear the stones at the bottom of the screen and use the fireman to fight the kraken. Once gone, have the sorceress grow a lily pad here. Upgrade your mill and sawmill if you haven’t already until both are level 3. Clear the stone obstruction and the pit, then repair the wharf. You’ve succeeded in making your way to the Crystal Caves, but will you be able to navigate the labyrinth to the other side? The Crystal Caves are enough to make your head spin. Upgrade the worker’s tent right away. Rebuild the farm. Clear the wood obstructions and collect the wood resources. Gather from the farm while clearing the paths down and to the right. Rebuild the second farm. Clear the way to the quarry and rebuild it. Clear the obstructions remaining on the path. Rebuild the stone bridge on the right. Clear the last obstruction on the path to the sorceress’s house. Rebuild the sorceress’s house. Next, banish the stone sleeper. Clear the path to the fireman’s house and the mine. Rebuild the mine. Upgrade the quarry at this point. Rebuild the fireman’s house. Once you have enough resources, banish the kraken tentacles and have the sorceress grow the lily pads needed to reach the other shore. Clear the obstructions leading to the altars here and restore them to complete your objective. Pick up the food resources outside and clear the wood obstructions on the path leading down. Rebuild the mill. Upgrade the tent. Clear the stone obstruction and gather resources until you have enough to remove the next stone obstructions. Rebuild the mine. Start clearing the obstructions past the town hall and leading the altar and the bridge. Make your way to the quarry. Rebuild the quarry. Clear the final obstruction on the left side of the map so you can now access both fishing nets. Rebuild the stone bridge. Gather resources until you have enough to repair both fishing nets. Upgrade the mine and clear the path leading to the wooden bridges. Repair both bridges and rebuild the fireman’s house. Restore the altar and repair the final fishing net beneath the fireman’s house to complete the level. Only sorceresses can know what to do when there’s no bridge. Upgrade the tent as soon as you start. Gather the food resources and clear the wood obstruction. Gather from the farm and start clearing the path to the right. Make your way to the altar for resources and the quarry. Rebuild the quarry. Make your way to and rebuild the marrymaker’s house. Clear the path leading down to the fireman’s house and rebuild it. Continue to clear the path toward the sorceress’s house. Rebuild the sorceress’s house. Continue to gather resources. Have the fireman banish the kraken tentacles and the sorceress grow lily pads in their place. Clear the path in this new area and restore the altar. Use the sorceress to grow lily pads to access the remaining portions of the map. Clear the upper right portion first and restore the altar here. Access the rightmost portion and fill in the large pit to reach the king’s statue. Upgrade the marrymaker’s house at this point and gather resources until you have enough to restore the king’s statue. Giant trees can even grow underground. Clear the wood obstruction outside the tent first. Upgrade the worker’s tent. Pick up the resources lying along the road outside the tent. Clear the obstruction blocking the way to the mill. Clear the way to the quarry and rebuild it. Clear the paths leading down and to the right. Gather all resources along the road until you reach the bridges. Upgrade the mill. Upgrade the mill again. Repair the stone bridge on the right and fill in the pit. Rebuild the sorceress’s house. Restore the bridge leading down toward the mine. Restore the road, banish the stone sleeper with the sorceress and rebuild the mine. Upgrade the quarry. Rebuild the bridge on the left and banish the stone sleeper. Fill in the large pit and use the sorceress to plant the large tree in the planter. If a troll eats well, he grows up to be huge. Only magic can take care of them. Clear the wood obstructions outside. Rebuild the mill. Clear the path to the farm and harvest from it. Upgrade the worker’s tent. Pick up all resources along the path. Clear the large wood obstruction on the right and pick up the resources along the path. Make your way to the blue portal and clear the path to the altar. Continue clearing the path leading to the quarry. Clear the obstructions toward the top of the map leading to the sorceress’s house. Upgrade the quarry twice. Upgrade the mill. Fill in the large pit blocking the way to the sorceress’s house. Rebuild the sorceress’s house. Send the sorceress through the green portal after activating it and banish the troll. Rebuild the mine. Have the sorceress activate the blue portal. Banish the troll on the upper left to access the signal fire. Restore all the trees with the sorceress. Continue to stock up on food. Light the signal fire to complete the level. Lots of monsters live underground. But our brave firemen could go up against the devil himself! Collect the resources outside the tent and clear the wood obstructions on the nearby paths. Upgrade your tent as soon as you have enough resources. Make your way to the sawmill and rebuild it. 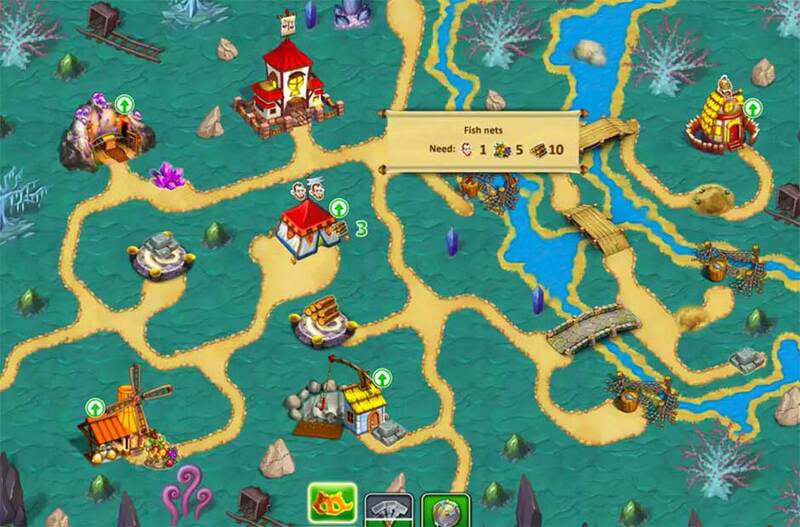 Gather from the sawmill, mill, and altar until you have enough resources to build the bridge. Clear the stone obstruction across the river and pave over the bog. Rebuild the sorceress’s house. Continue clearing the path as you make your way up toward the quarry. Rebuild the wooden bridge on the lower right side. Fill in the pit in front of the quarry and rebuild it. Pave over the bog in the lower right corner to access and rebuild the fireman’s house. Use the fireman to get rid of the kraken. There are two of them: one on the upper left and one on the upper right. Once gone, use the sorceress to grow lily pads to access the other shores. Once accessed, have the sorceress plant trees. Repair the well near the mill to have the fireman water them. Upgrade the mill as you’re able during this time to complete your objectives. The journey continues, and there’s still lots to do! Collect the resources outside the tent and clear the wood obstruction. Continue to gather until you have enough resources to restore the farm. Once done, gather all remaining resources and clear the way to the sawmill. Rebuild the sawmill. Upgrade the tent. Clear the stone obstruction blocking the way to the quarry. Rebuild the quarry. Repair the bridge north of the farm. Clear the obstructions leading to the mill and the fireman’s house. Upgrade the quarry. Upgrade the mill. Rebuild the fireman’s house. Repair the stone bridge on the right and clear the way to the sorceress’s house. Restore the altar nearby. Rebuild the sorceress’s house. Banish the giant troll on the left and rebuild the mine. As soon as this is done, clear the remainder of the paths and use the sorceress to restore the trees. When there are many portals, you need to try not to get confused! Clear the wood obstruction and repair the bridge. Continue to clear the path leading to the mine. Rebuild the mill. Upgrade the tent. Rebuild the mine. Clear the way to the sorceress’s house and rebuild that, too. Pave over the bog and have the sorceress activate the green portal. Once activated, go through the portal and clear the path leading to the fireman’s house and the blue portal. Rebuild the fireman’s house. Remove the thornbush below the green portal with the fireman. Rebuild the quarry. Have the sorceress activate the blue portal. Go through the blue portal and clear the obstructions. The sorceress will need to remove the stone sleeper. Rebuild the sawmill. Upgrade the mill. Activate the purple portal and once through, banish the giant troll. Pave over the last remaining bog and restore the king’s statue. An ancient and long forgotten holy stone circle: You must restore it! Pick up the wood and clear the wood obstruction. Upgrade the tent. Harvest from the farm and pick up surrounding resources. Clear the path to the quarry and rebuild it. Rebuild the lower bridge and start clearing the road leading to the left. Make your way to the sawmill and rebuild it. Keep gathering resources and upgrade the sawmill. Fill in the pit in front of the fireman’s house and rebuild it. Upgrade the mill. Upgrade the sawmill again. Repair the stone bridge near the farm to the left. Restore both the altars, near the farm and near the mill. 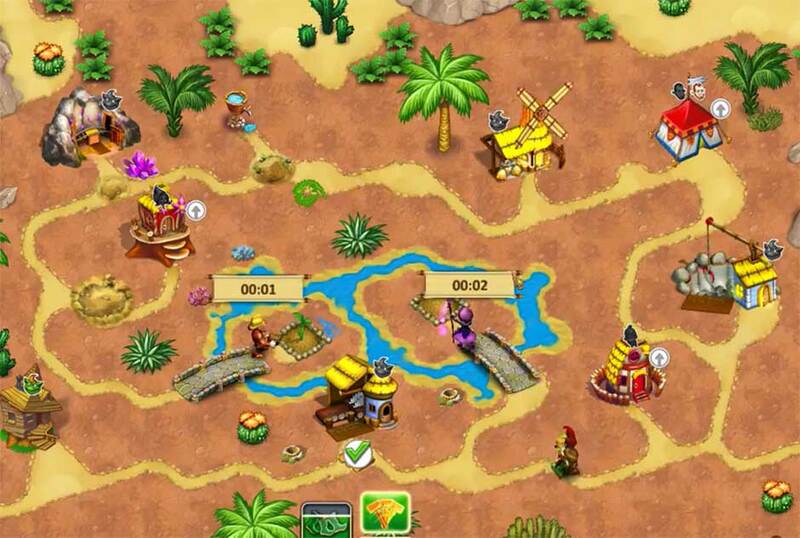 Continue to gather resources, upgrade the worker’s tent and the quarry until it reaches level 3. Rebuild the stone bridge on the lower left. 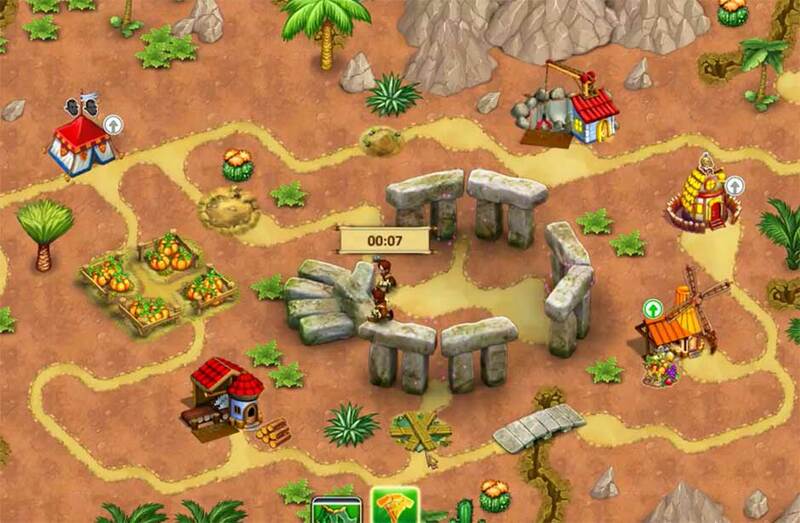 Restore all of Stonehenge to complete the level. There’s a legend that the magical trees are the forebears of all the plants in the kingdom! Pick up the resources around the tent and clear the obstructions on the path leading south. Upgrade the worker’s tent. Clear the road to the mill and start gathering from there. Clear the obstructions on the path leading north and rebuild the bridge. Continue clearing the upper paths. Rebuild the sawmill. Make your way to the quarry and rebuild it. Continue to gather resources and upgrade the sawmill. Upgrade the quarry and mill as well. Rebuild the mine and the sorceress’s house. Fill in the pit blocking the green portal and activate it with the sorceress. 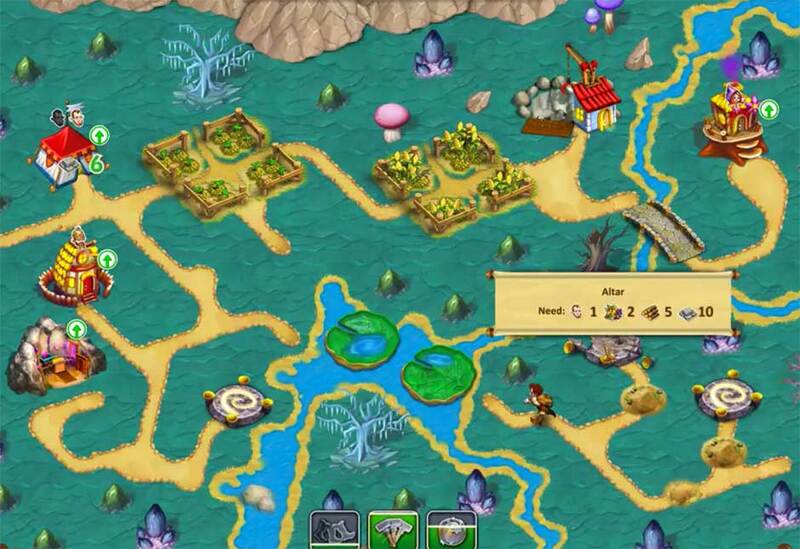 Use the green portal to access the upper left corner of the map. Clear the path leading to the fireman’s house and rebuild it. Activate the blue portal and use it to access the bottom portion of the map. Banish the giant troll with the sorceress and rebuild the stone bridge. Upgrade the sorceress’s house and the mill. Pave over the bog and banish the last troll to access the planter needed for the sorceress to plant the large tree. Gnomes love to have fun, but they love to work even more. Clear the wood obstruction and upgrade the worker’s tent. Gather the surrounding resources and clear the path to the farm. Harvest from the farm and clear the surrounding paths. Rebuild the mill. Pave over the bog in front of the town hall and use it to exchange resources as necessary. Clear the path to the altar and the marrymaker’s house. Restore the altar. Rebuild the marrymaker’s house. Rebuild the fireman’s house. Build the wooden bridge to the right of the town hall. Rebuild the sorceress’s house. Use the sorceress to banish the stone sleeper to the immediate right and activate the green portal. Once through the green portal, clear the surrounding paths until you reach the mine. Rebuild the mine and upgrade your worker’s tent. Activate the blue portal and banish the stone sleeper on the other side. Have the fireman remove the thornbush. 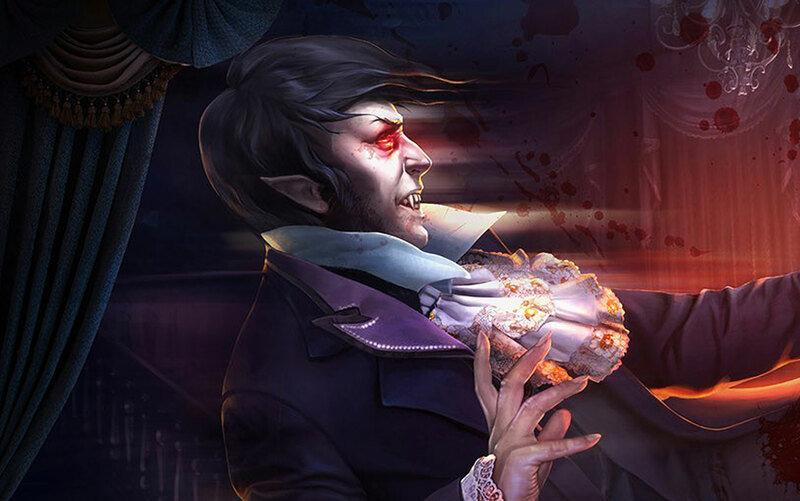 Upgrade the marrymaker’s house and continue to gather resources until you have enough to complete all your objectives. The path to the Grey Wastelands is far. A long road full of danger lies ahead of you. You must stock up on provisions. Gather the surrounding resources and clear the wood obstruction. Upgrade the worker’s tent. Make your way to the farm and restore it. Clear the path leading up to the mill. Rebuild the mill. Continue to gather from the surrounding area. Make your way to the fireman’s house. Rebuild the nearby altars on the upper portion of the map. Rebuild the wooden bridge toward the upper right. Clear the path leading to the quarry and rebuild it. Restore the nearby altar. Now rebuild the sorceress’s house and the fireman’s house. Use the fireman and the sorceress to banish the kraken tentacles and grow lily pads in their place. You can now access the lower portions of the map. Start with the lower right side and clear the path to the mine. Rebuild the mine. Clear all remaining paths so that you can access the three fishing nets. Use the town hall to exchange resources as necessary. Repair all fishing nets and stock up on 50 food resources to complete the level. So here’s the Great Grey Wastelands. The only people who live here are despicable gremlins and the evil warlock that kidnapped the princess’s family. It’s about time to pay him a visit in his dwelling at the foot of an enormous volcano. Gnomes don’t like travelling great distances on foot. Upgrade the tent right away. Pick up the resources outside the tent and make your way toward the mill. Rebuild the mill once you have enough resources. Continue toward the sawmill, clearing the path until you reach it. Rebuild the sawmill. Clear the path leading toward the quarry. Once you reach it, rebuild it. Clear the remaining paths leading to the portal and the altar, then finally the cableway. Restore the cableway and make your way to the sorceress’s house. Rebuild the sorceress’s house. Collect the crystals available and use the sorceress to activate the green portal. Once activated, rebuild the fireman’s house. Clear the stone obstruction to reach the blue portal and the other altar. Restore it and activate the blue portal. Past the blue portal, fill in the large pit and finally light the signal fire. Don’t forget to plant the remaining trees in the planters on the left side of the map. Make sure the fireman can reach the well between the tent and the cableway in order to water these trees. The magical trees can endure any hardship. That’s why their seeds are so valuable. Clear the wood obstruction outside the tent and upgrade it. Pick up all the resources around the tent and harvest from the farm. Make your way to the altar so you can utilize it. Continue toward the sawmill and rebuild it. Rebuild the bridge. Continue to clear the path toward the quarry. Rebuild the quarry. Upgrade the quarry twice. Clear the path leading to the sorceress’s house and rebuild it. Rebuild the second bridge. Fill in the pit and use the sorceress to banish the stone sleeper. Rebuild the beehive between the first and second bridges to get rid of the bees blocking the path. Rebuild the mine. Upgrade the sorceress’s house and activate the purple portal. Banish the troll on the other side. Fill in the last pit and plant the large tree to complete the level. It’s just ash, lava and fire here. Unsurprising that the warlock is a little out of sorts. Pick up the resources outside the tent. Clear the obstructions leading to the mill. Rebuild the mill. Rebuild the sawmill. Upgrade the tent. Clear the path leading up toward the fireman’s house. Continue clearing it toward the mine and the farm. Harvest from the farm and rebuild the quarry. Rebuild the fireman’s house. Rebuild the mine. Upgrade the quarry twice. Continue clearing the path leading down to the sorceress’s house. Rebuild the sorceress’s house. Upgrade the worker’s tent. Rebuild the two stone bridges and pave over the bog on the left to reach the well. Repair the well. 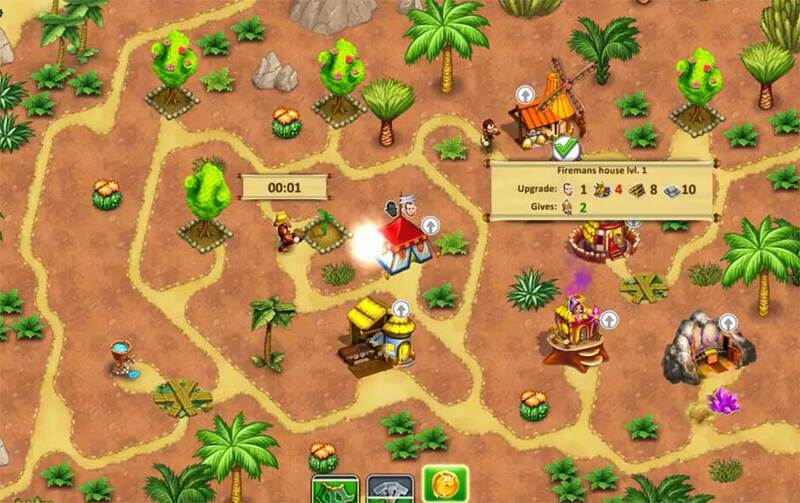 Use the sorceress to plant trees in the planters and the fireman to water them, thus completing the level. This location is a breeding ground for stone doormice. Pick up the resources outside the tent and clear the road leading to the farm. Harvest from the farm. Upgrade the worker’s tent. Continue to clear the path leading to the altar and the sorceress’s house. Rebuild the sorceress’s house. Clear the road leading to the sawmill – remove the stone sleeper with the sorceress. Rebuild the sawmill. Clear the path leading down to another altar and the quarry. Once completely cleared, rebuild the quarry. Upgrade the tent and the sorceress’s house again. Clear the remaining paths on the left. Upgrade the sorceress’s house one last time and rebuild the marrymaker’s house. Finish repairing the altars to complete the objective. Even in volcanic valleys there are quiet, suitable spots to grow strawberries. 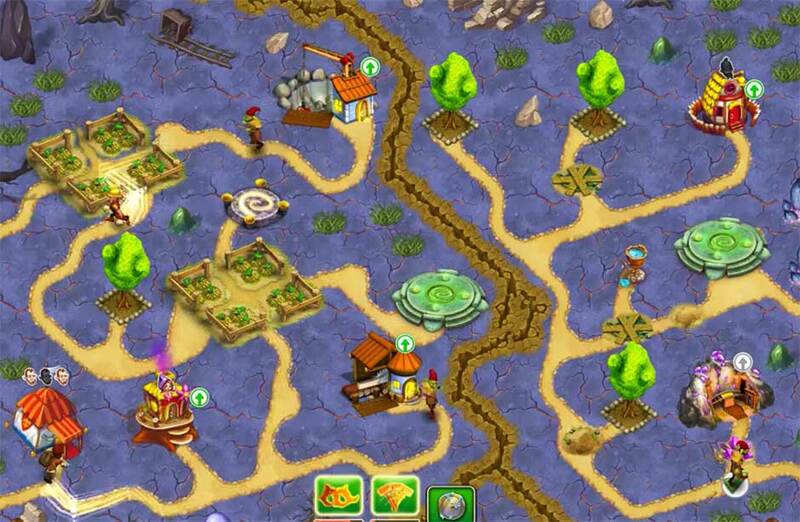 Pick up the food resource and start clearing the obstructions leading to the first farm on the left and right. Rebuild the farm on the left, followed by the one on the right. Harvest from both, clearing the path to the farm in the bottom right corner. Restore it, then rebuild the sawmill. Upgrade the tent. Three of five farms should be restored at this point. Restore the fourth farm on the right and rebuild the quarry. Clear the path to the mine and rebuild it. 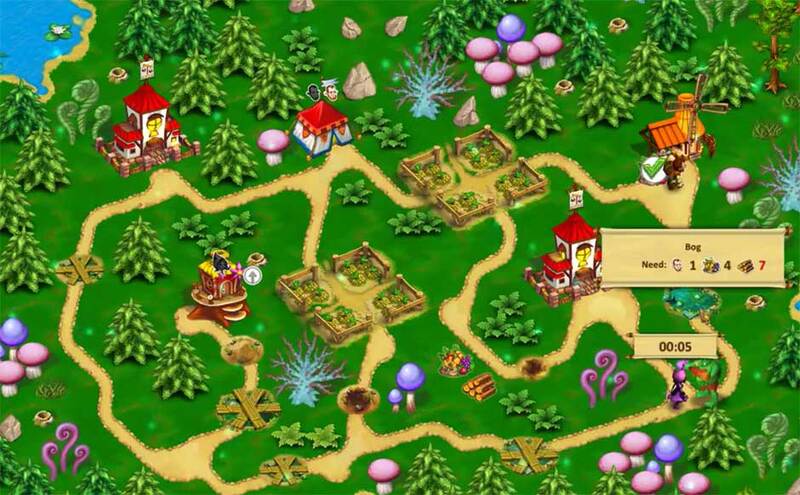 Continue to gather food as you clear the path leading to the farm in the upper left corner. Restore it and continue to gather food resources for your objective. Clear the paths to the sorceress’s house and the fireman’s house and rebuild both. Have the sorceress plant trees in the four planters and have the fireman water them. The well the fireman will need to do this is located to the left of the tent. The altars that need restoration are to the right of the middle farm and in the bottom left corner of the map. The sparse fields here with flowers attract veritable legions of bees. Here everything fights just to exist! Pick up the resources outside the tent and remove the wood obstructions. Upgrade the tent. 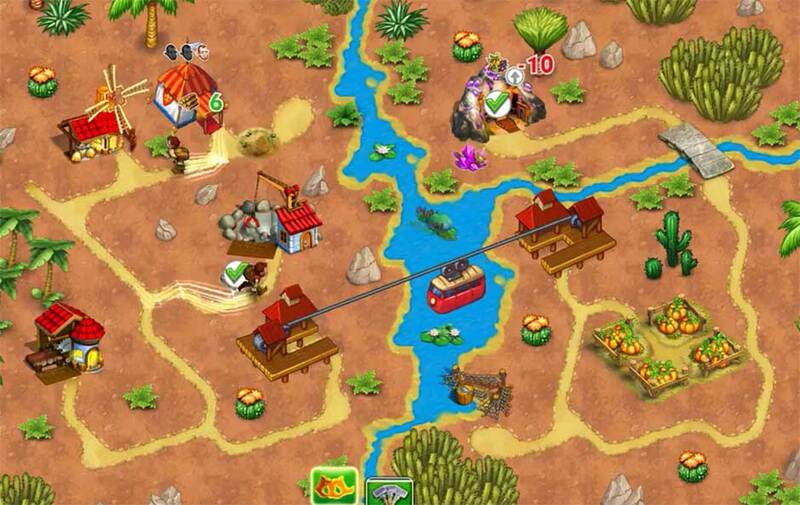 Clear the obstacles leading to the farm and harvest it for food. Pave over the bog leading to the beehive and restore it to clear the path on the left. Clear the way to the sawmill and rebuild it. Continue clearing the lower path leading toward the quarry. Rebuild the quarry. Continue gathering resources and upgrade the sawmill. Upgrade the quarry. Upgrade the sawmill again. Upgrade the quarry again. Rebuild the mine in the upper right corner. Clear the lower path leading to the altars. Restore both altars. Clear the obstruction blocking the way to the sorceress’s house. Rebuild the sorceress’s house. Pave over the bog in the bottom right corner and restore the brown beehive here. You can now access the third beehive on the left. Restore this beehive, then rebuild the stone bridge on the right. Clear the path leading to the fireman’s house and rebuild it. Upgrade it twice. 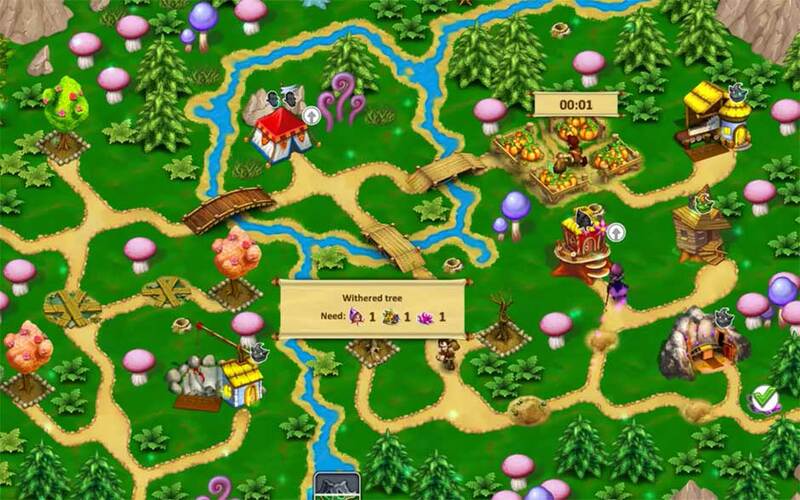 Click on each of the trees to have the sorceress restore them and complete the level. The warlock has a small army of troll giants. There must be some cowardly gremlins nearby. Start by clearing the path leading to the farm. Upgrade the worker’s tent and harvest the food at the farm. Work your way to the sawmill and rebuild it. Clear the blockage in front of the sorceress’s house and rebuild it. Banish the large trolls to the left and right of the farm with the sorceress. Clear the path leading up to the second farm. Restore the farm. Remove the last giant troll on the left and clear the path to the quarry. Rebuild the quarry. 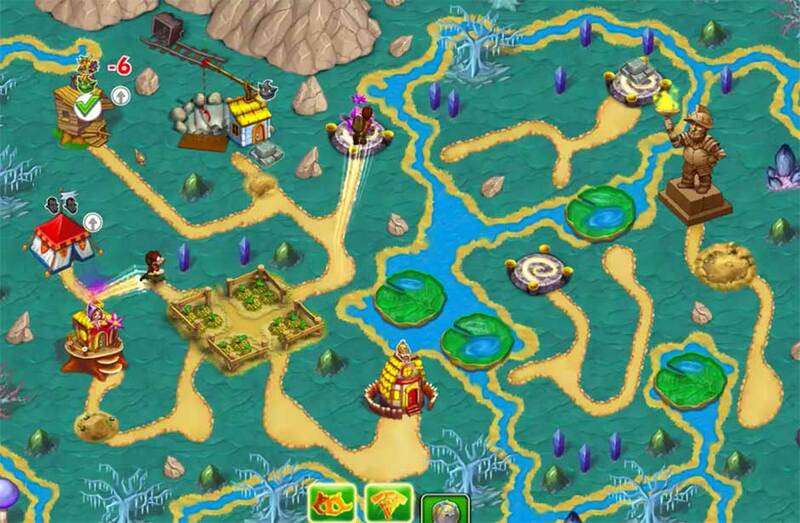 Activate the green portal on the left side of the map to reach the right side. Once there, clear the paths leading both up and down, using the sorceress to banish the large trolls. Clear the path to the mine and rebuild it. Rebuild the fireman’s house. Plant trees with the sorceress and have the fireman water them. The well necessary for this action is to the immediate left of the green portal on the right. Stock up on crystals to complete the level. There’s lava and deep crags everywhere. You must build bridges and activate portals. Clear the obstructions outside the tent and rebuild the wooden bridge on the right. Continue clearing obstructions until you reach the farm, then harvest from it. Upgrade the worker’s tent. Rebuild the sawmill. Clear the path leasing toward the sorceress’s house and upgrade the sawmill. Wait until you have enough resources, then rebuild the bridge on the right and clear the path leading to the quarry. Rebuild the quarry. Rebuild the sorceress’s house and activate the green portal. 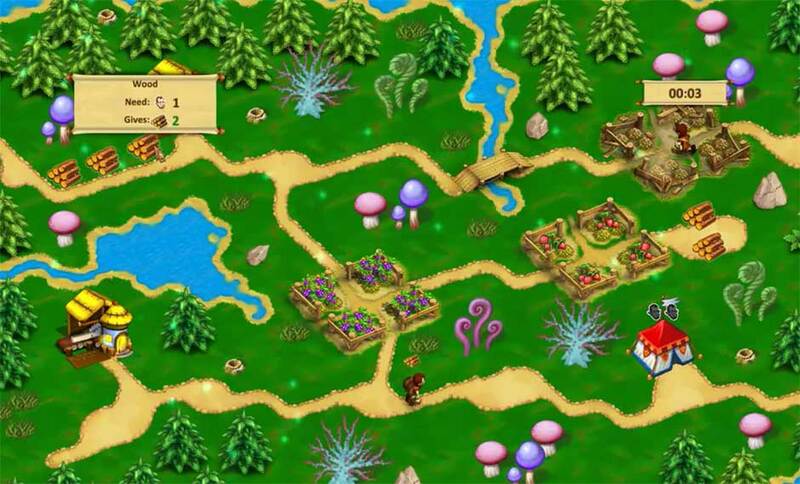 Use the green portal to reach the lower left corner of the map. Rebuild the stone bridge and fill in the large pit to reach the mine. Rebuild the mine. Upgrade both the mine and the quarry. Restore the altar beneath the farm and repair the stone bridge leading to the blue portal. Activate the blue portal and use it to reach the purple one in the lower right corner. 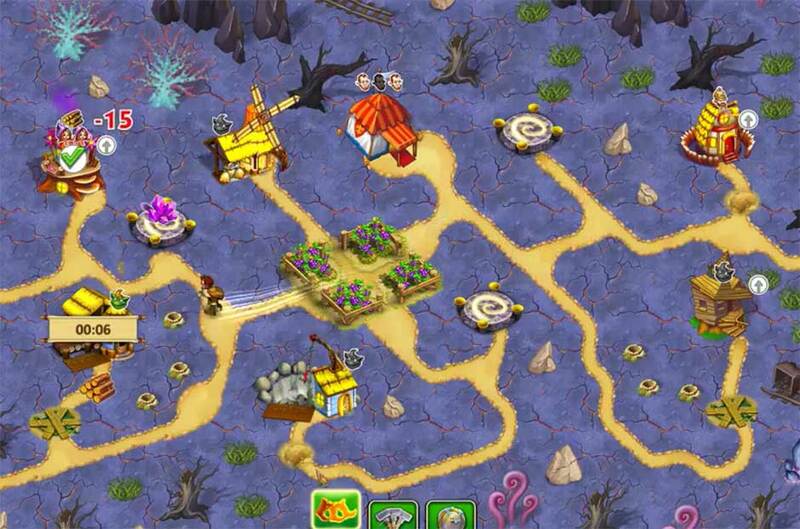 Pave over the bog in the lower right corner to gain access to the purple portal. On the other side, pave over the final bog to reach the king’s statue. Restore it. A great place to plant a giant tree! Let the warlock see the power of gnomes right outside his palace window. Pick up the resources outside the tent and clear the paths to the left and right. Upgrade the tent once you reach the mill. Continue clearing the paths leading up and down on the left. Head up to the sawmill and rebuild it. Upgrade the mill. Make your way down to the sorceress’s house and clear the path to the cableway. 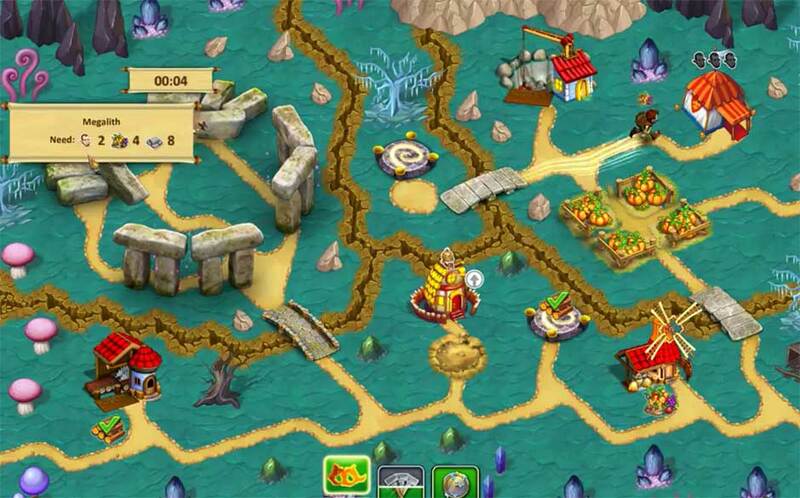 Restore the altars on the left side of the map to gain access to crystal resources. Rebuild the cableway. Rebuild the sorceress’s house. Move to the right side of the map and clear the path leading up to the fireman’s house and the quarry. Rebuild the quarry. Rebuild the fireman’s house. Clear the path leading down to the last altar and restore it. Repair both bridges and pave over the bog and the large pit. Plant the large tree with the sorceress in the lower right corner and water it via the fireman. Light the signal fire and stock up on wood and food to complete the level. There was once an oasis with magical trees here, but now there’s just dry land and wind. The sorcerers will fix this! 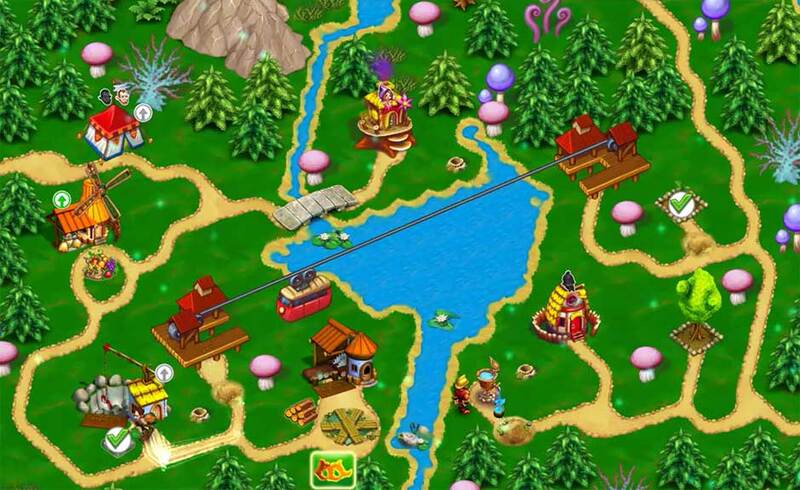 Repair the wooden bridge and make your way to the farm. Harvest food resources. Clear the path leading to the bottom left corner of the map. Collect from the altar and head to the mill. Rebuild the mill. Upgrade the worker’s tent. Clear the path on the left leading to the quarry. Rebuild the quarry. Clear the path leading upward and repair the stone bridge. Restore the road leading to the sawmill and rebuild it. Focus on restoring the stone bridge below the worker’s tent and make your way toward the sorceress’s house. Rebuild the sorceress’s house. Restore the path and fix the bridge leading to the fireman’s house in the upper right corner and restore it. Rebuild the well to the left of the sorceress’s house. Clear all remaining paths and use the sorceress to plant trees. Water them with the fireman. Restore all remaining altars and gather resources until you’ve completed your goals. Just a little bit longer. Soon you’ll reach the warlock’s domain and save your family. Upgrade the worker’s tent right away. 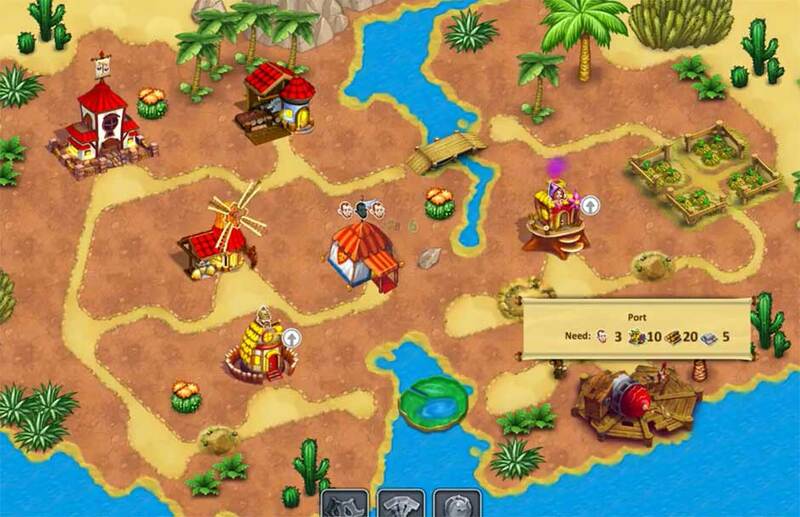 Collect all the resources around the tent and focus on reaching the mill. Once you’ve reached it, continue down the path on the right and repair the wooden bridge. Clear the path leading up to the sawmill and rebuild it. Clear the path to the right of the altar near the tent. Upgrade the sawmill. Rebuild the wooden bridge near the tent leading up and rebuild the quarry. Restore the altar on the right side of the map and clear the way to the sorceress’s house. Rebuild the sorceress’s house. 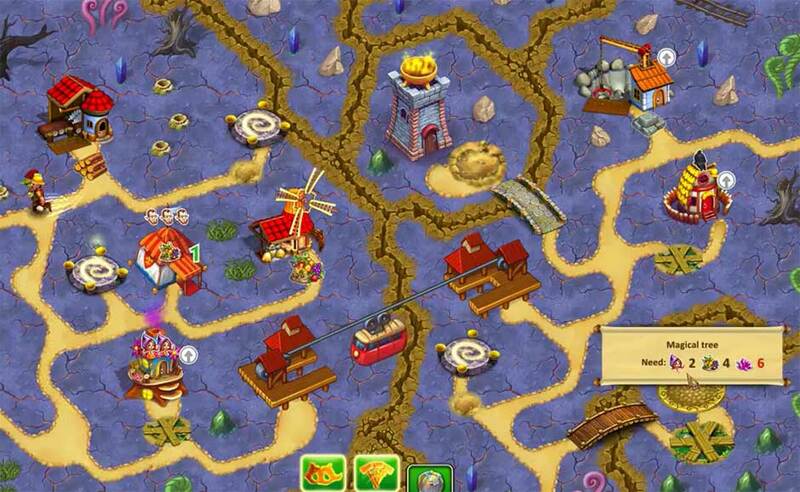 Banish the giant troll on the upper left and rebuild the fireman’s house. Head to the green portal and activate it. Use it to reach the right portion of the map. Restore the stone bridge at the bottom of the map and fill in the pit to activate the blue portal. Through the blue portal, banish the troll and restore the altar before activating the purple portal. Banish the troll on the other side of the purple portal to access the signal beacon. 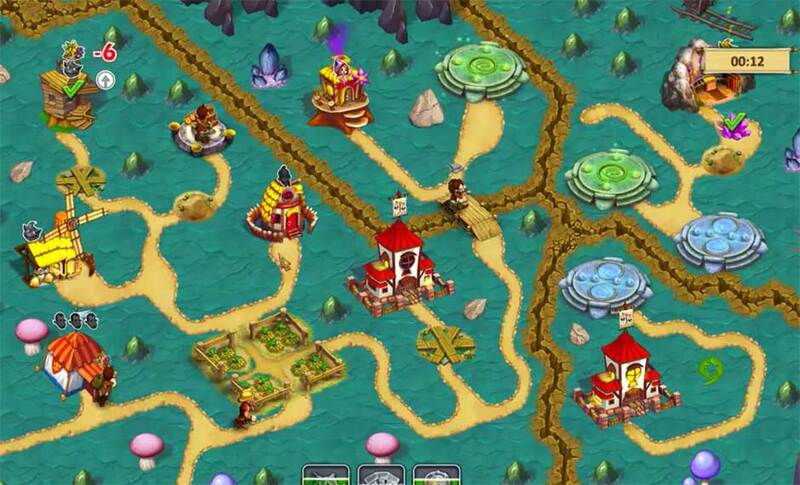 Upgrade the fireman’s house and sorceress’s house to level 3 and rebuild the king’s statue on the upper right to complete the level. Look at all the glass snowglobes! Each has someone’s castle. But the princess can find hers, even amidst a million! Clear one wood and one stone obstruction before upgrading the worker’s tent. Continue clearing the path to the farm and restore it, but not before reaching the mill. Once reached, you can restore the farm. Continue clearing the lower path and rebuild the sawmill. Upgrade the sawmill. Upgrade the mill. 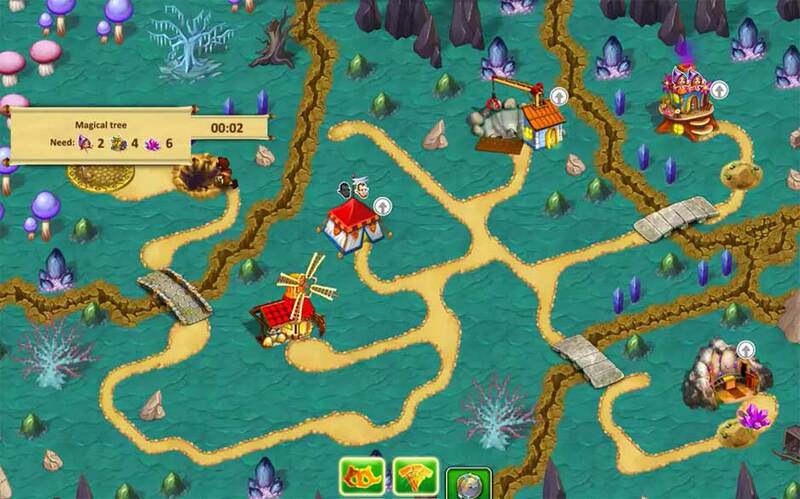 Continue to collect resources and make your way to the sorceress’s house. Restore the altar on the lower path. Rebuild the bridge in the upper right corner and make your way to the green portal. Rebuild the sorceress’s house. Make your way to the town hall so you can use it to trade for resources as needed. Activate the green portal and use it to access the lower right corner of the map. Clear the paths to the quarry, then the fireman’s house. Rebuild the quarry. Rebuild the fireman’s house. Activate the blue portal to reach the upper right corner of the map. Banish the stone sleeper and head for the purple portal. Once activated, clear the path past the purple portal and banish the giant troll here. Continue to clear all obstructions until you reach the enchanted castle. You will need to upgrade your sorceress’s house to level 3, as well as have 10 food and 15 crystal resources to disenchant it. Once completed, the kingdom will be saved! Congratulations! You’ve completed Gnomes Garden 3! Be sure to check out our blog for more tips and tricks! 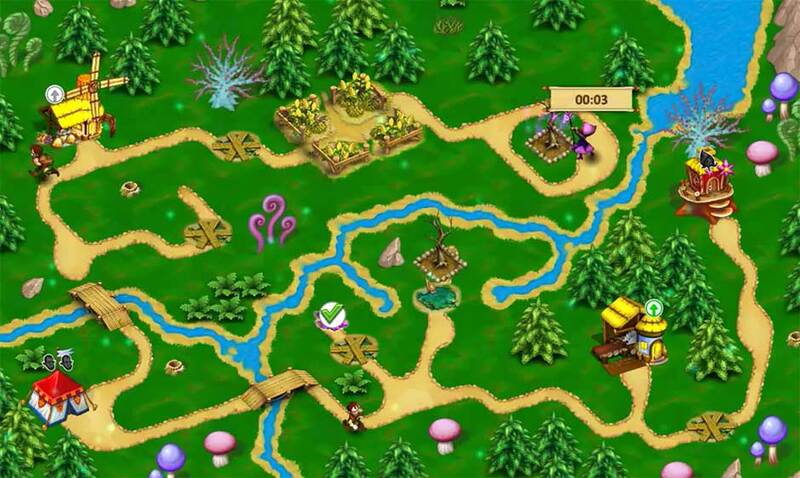 The Gnomes Garden 3 Walkthrough is meant as a guide and does not contain cheats, hacks, or serials.